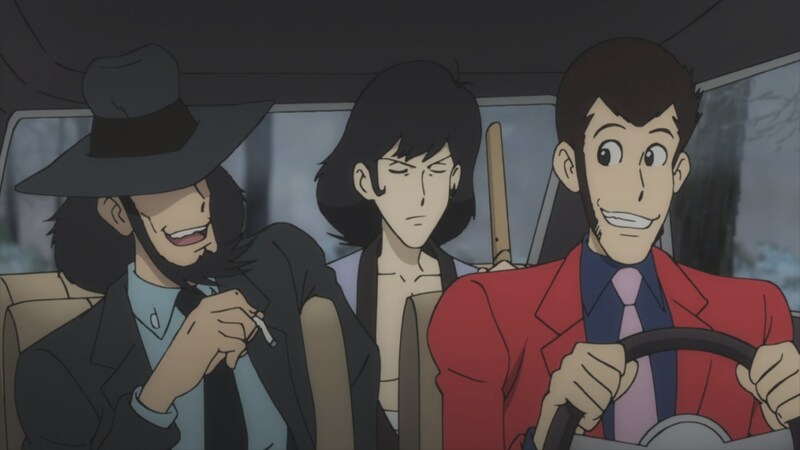 Lupin, Jigen, and Goemon return to Russia where the Russian mafia stashes their money. As Lupin and company are about to pull of the heist, another three-man team beats them to the score. 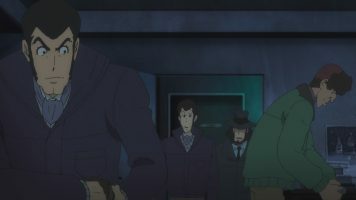 Lupin notices that one of the three looks like Zenigata. He goes to pull off a second job, but again, the other gang beats them to the punch. Lupin thinks it is a trap, but is stunned to witness Zenigata steal a case full of jewelry. 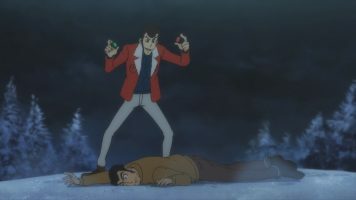 Lupin’s third attempt also fails due to Zenigata beating him. However, Jigen and Goemon get Zenigata’s companions arrested. 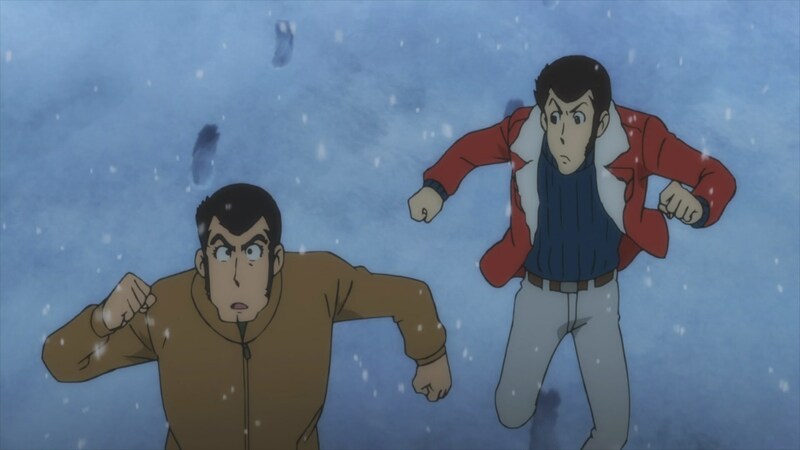 Lupin catches Zenigata on a snowmobile and learns the cop has amnesia. Zenigata now goes by the Polish name Monety. He ditches Lupin and returns to the hideout. Zenigata is without his partners, so he gets drunk and reflects on the events that led him here. He vows to continue thieving. 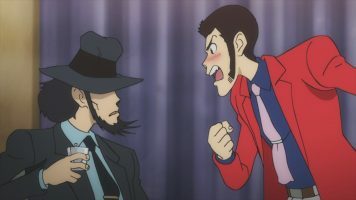 Elsewhere, Lupin gets drunk, frustrated that Zenigata is beating him at his own game. To make matters worse, Zenigata takes a page from Lupin’s playbook and announces his next heist. Zenigata easily penetrates his mansion target despite the insane amount of security present. Lupin decides to crash the party and also makes it to the mansion. The two arrive at the two gems Zenigata planned to steal. They both take a gem and escape. 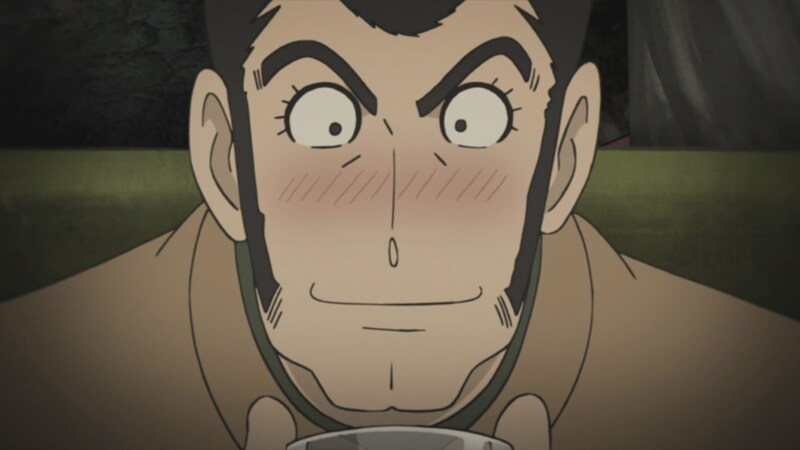 Zenigata is very happy because he’s beaten Lupin. He doesn’t know why he feels that way. When he accidentally slaps a pair of cuffs on Lupin, Zenigata starts having his memory come back. Lupin escapes with both gems. Meanwhile, Zenigata makes a public announcement about his amnesia and vows to go after Lupin once more. In Lupin the Third Part 5 – 20, Red Jacket Lupin returns to give us a Slavic adventure circa the early 90s at the latest. One of the fun things about the Red Jacket episodes is that they are always set in the past. In this case, Russia of the early 1990s after the Communist government failed. Having lived through those times ( ? ), it is fun for me to see Walkmans or those mono boom boxes. Initially, I thought that the episode may have been set in Poland. That’s because the term “monety” came back as Polish. But I talked to a Polish friend of mine and he said they were saying монета (moneta) not монеты (monety). He didn’t understand why the English translator went with Monety for Zenigata’s name since it was clearly Moneta. 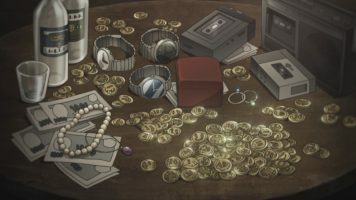 Also, moneta means “coin” and monety means “coins.” The Japanese said “moneta” meant “kane” (money), which isn’t correct. Yeah, coins are are money, but there’s a different Russian word for money (Деньги — Den’gi). I have to say that I found it rather amusing to see Zenigata in the role of a thief. It makes sense that in order to try to catch Lupin, he’d have to think like Lupin and know how to steal like Lupin. When I think about it, this goes to show why Zenigata is the only one who could ever hope to catch Lupin. Lupin’s superior skills are what keep him out of Zenigata’s grasp. 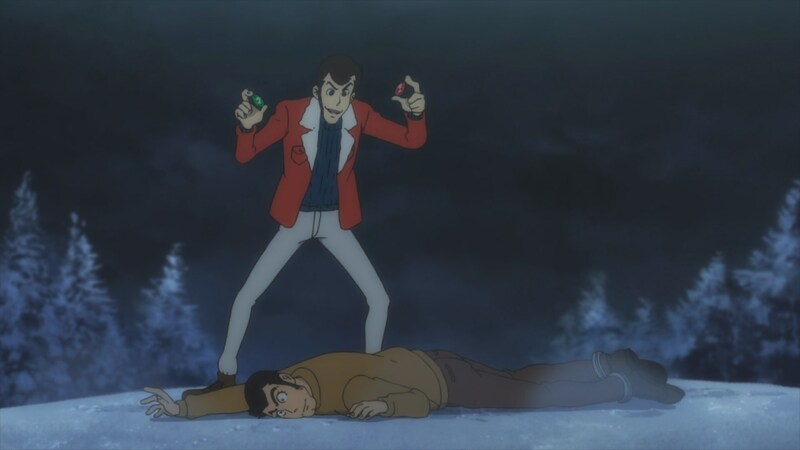 Speaking of Lupin, I got a kick out of him getting depressed at Zenigata beating him to the punch. 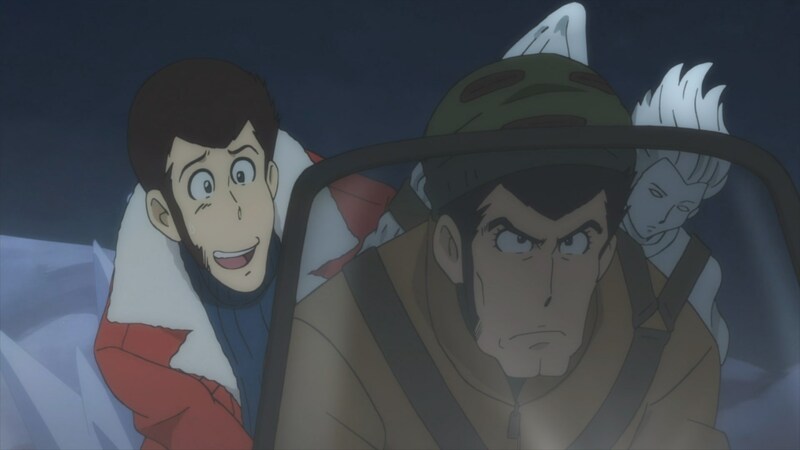 Zenigata and Lupin have this odd relationship. Zenigata needs Lupin so that his life has meaning. Lupin needs Zenigata to make things interesting. Thus we have the reason Lupin returned to Russia to check up on Zenigata. But we also see Lupin sulk a bit at the thought of Zenigata being as good a thief as Lupin is. OK, time to finish my review of Lupin the Third Part 5 – 20. No Fujiko in this episode. 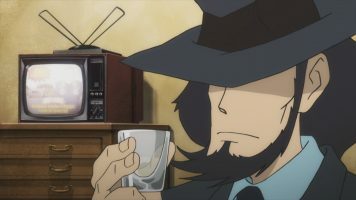 Although this was a Zenigata episode, Goemon and Jigen both got moments to shine. 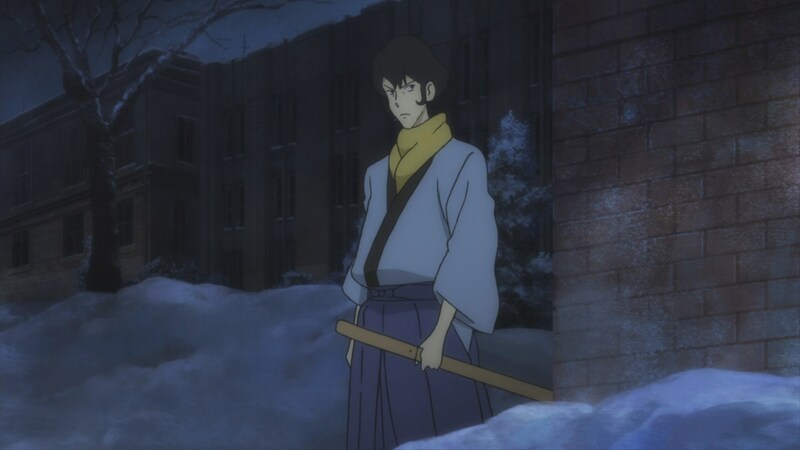 I’m pretty sure Goemon has worn some sort of winter attire before. As such, I’m not sure why seeing him wearing a scarf amused me. In the end, Lupin the Third Part 5 – 20 was an amusing episode, allowing Zenigata to shine and take Lupin’s role as master thief. 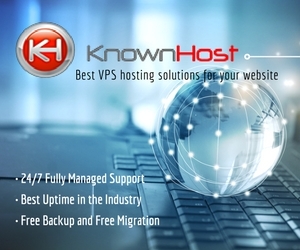 Thanks for the info regarding the “monety” pseudonym. This was my favorite one shot of the series. I cracked up when Zenigata’s memory started returning and he recalled the time Lupin was in drag ! LOL ! I’m pretty sure Lupin left with Zenigata on purpose just to help him get his memory back.